Much of my cooking is driven by the pressing need to use up things before they spoil and this wokful of yum was no exception. We had two weeks' worth of garlic scapes from our CSA, a large head of cabbage - also from the CSA, a small bag of snap peas from my mom-in-law's garden, two scallions I'd meant to use in something else but had forgotten, and a glass tupperware full of leftover pork loin chops from cousin Norah's farm in Vermont that we'd barbecued for dinner the night before. I was blown away by how GOOD the pork was - tender, flavorful and juicy -- even our picky five-year-old gobbled it down. All those whimsically curly garlic scapes were weighing heavily on my mind so I thought a stir-fry was in order. 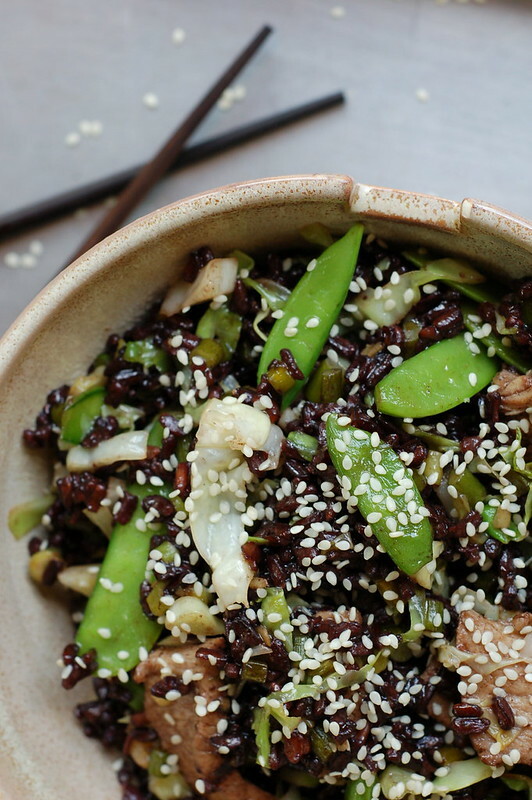 I started a pot of rice - my new favorite - Lundberg's Black Japonica - a strikingly pretty blend of purple and red, short- and medium-grain rice with a nice, nutty flavor that takes about 40 minutes to cook. Then it was time to slice and dice. Stir-fries are all about prep, in my opinion. Once everything is cut up, the rest is pretty easy and quick. But you really gotta have everything in place before you start to fry or things get very stressful. 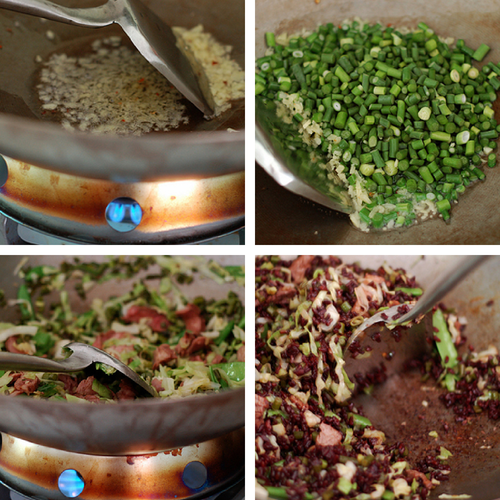 Click for some quick tips on how to stir-fry. 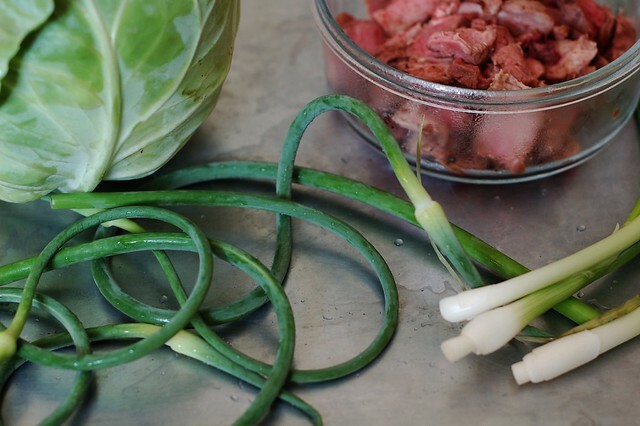 When the garlic scapes, cabbage and scallions were sliced, I turned my attention to the making of sauce. I used a combination of soy sauce, sesame oil, rice mirin, hoisin sauce, oyster sauce and a little bit of apricot jam. I really like to have a mix of savory and sweet and this hits those notes nicely. Then it was time to fry! I use peanut oil because it has a nice high smoke point. Then start with the "aromatics" - ginger, garlic and hot pepper flakes - and fry them for 30 seconds or so to flavor the oil. Then add in ingredients in the order of amount of time needed to cook, ending with the rice, followed by the sauce. 1. Prepare the rice. 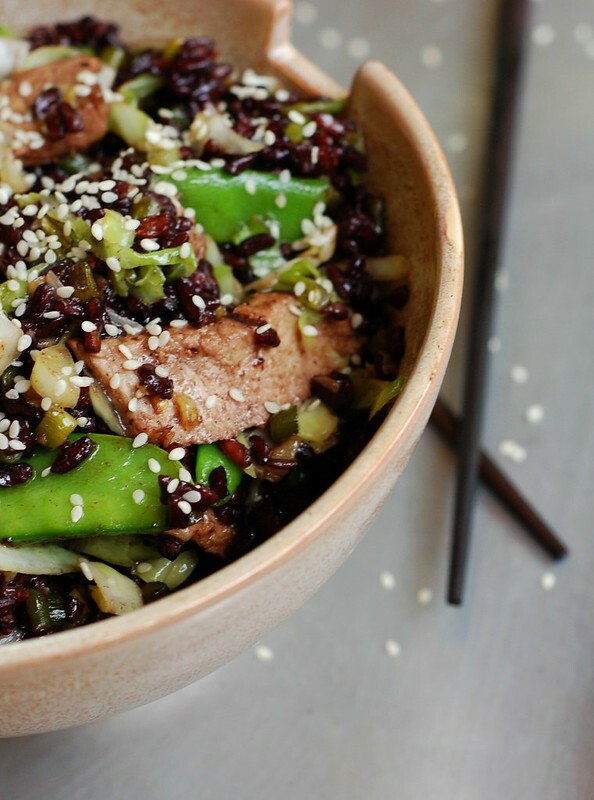 Ideally, you do this hours earlier and give it a chance to cool completely but if not, make sure you start it early enough to be finished in time to add it in to the stir-fry. Prepare according to the directions for the type you're using. You should be making roughly one cup of dry rice to yield roughly two cups of cooked rice. 2. Do all the slicing and dicing needed to get everything ready to go into the wok for cooking. 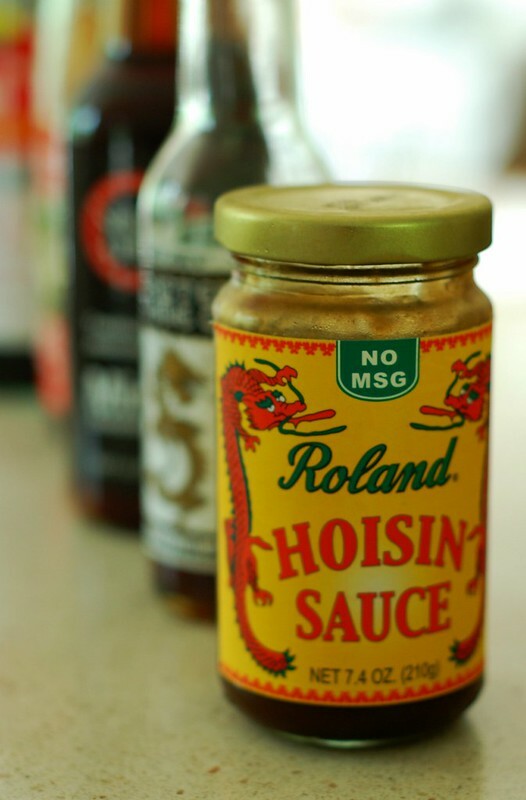 Prepare the sauce by simply mixing the ingredients listed above together well, tasting and adjusting to make it saltier, sweeter, etc. Once you're happy with the taste, it's time to add the cornstarch to ensure that it thickens up nicely in the dish. 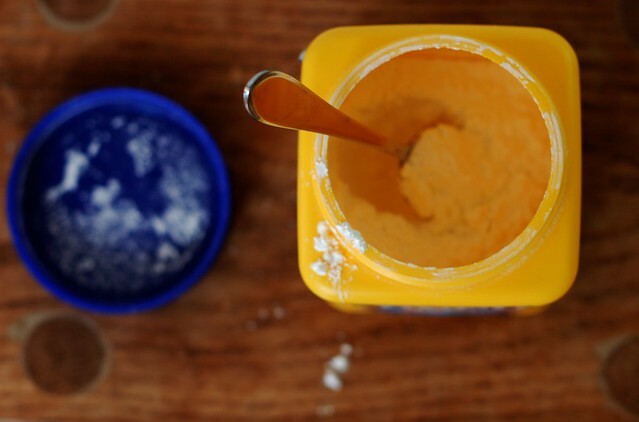 Make a slurry by combining the cornstarch with a little warm water and mixing well to dissolve it all. Then pour the slurry into the sauce and stir well. 3. Heat the oil over high heat in your wok or large saute pan. Add the ginger, garlic and hot pepper flakes and cook, stirring for roughly 30-60 seconds - not long enough for any of it to burn but long enough for the great flavors to infuse the peanut oil. 4. Toss in the garlic scapes and cook for 1-2 minutes, stirring often. 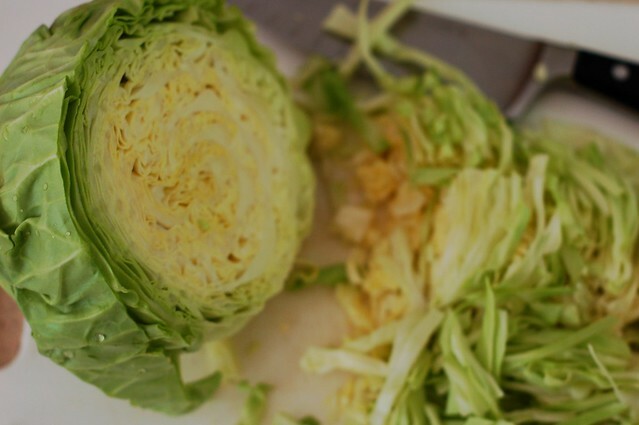 Then add the cabbage and carrots. Then the scallions and fry for another 2-3 minutes, stirring often. Throw in the sliced pork and cook for another 2 minutes before adding the rice and stirring well to ensure that each grain is coated with the peanut oil. Remove from the heat and serve, topped with toasted sesame seeds 'cause they're pretty.